The ACS-64, also known as the "Amtrak Cities Sprinter", is Amtrak's replacement of the aging AEM-7 and HHP-8 electric locomotives for operation in the Northeast and Keystone Corridors. Built by Siemens and based on the EuroSprinter European electric locomotive design, the Cities Sprinter is nonetheless a unique model to North America and is built entirely in the United States. The Prototype, entering service as of February 2014, is meant to pull as many as 18 Amfleet cars at speeds of up to 125 miles per hour! 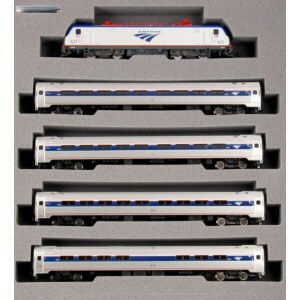 Amfleet I: During its beginnings, Amtrak inherited its passenger cars from other railroads. Old, steam heated and in dire need of upgrades, Amtrak set out to replace these cars in 1973 with the purchase of the first Amfleet cars from Budd. 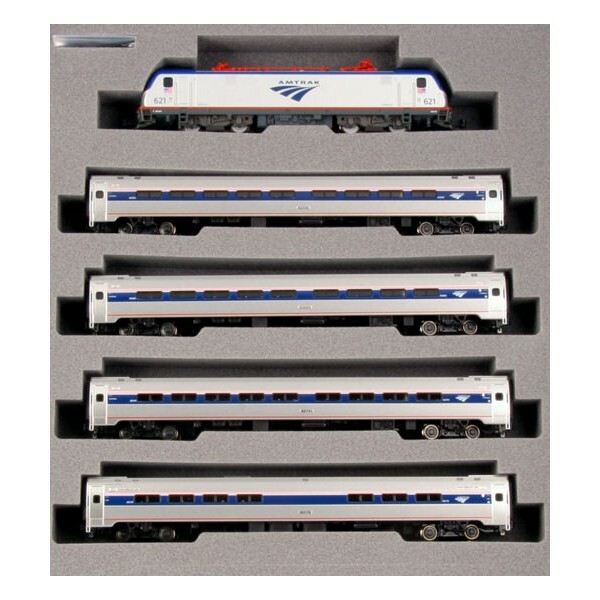 This initial batch of 492 cars were the Amfleet I - with a door and vestibule on either end (unlike their single-doored successor), these cars fell into a few different varieties but essentially broke down into coach and dinette variants. Despite the introduction of their newer cousins, Amfleet I's are still in use by Amtrak, primarily for shorter distance routes.